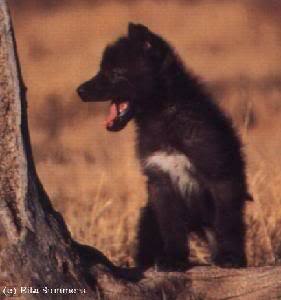 Appearance: A large pitch black wolf with electric emerald green eyes and large paws. 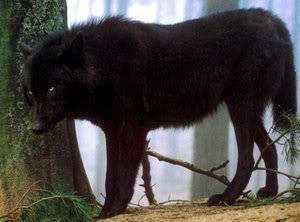 Personality: She is a shy wolf thats normally tends to herself. She hasnt interracted with other wolves since she was a pup. Phoenix was named after the firery bird because her black fur seems to look like feathers. 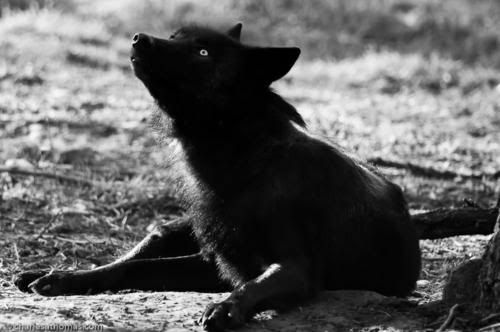 Other than her shy personality, Phoenix is a very beautiful wolf. 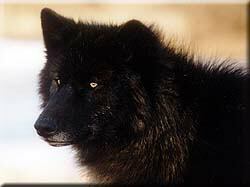 Male wolves seem to get interlaced and trapped in her green eyes and can look away ( ). History: She has lived alone most of her life but has been with her family until they were killed by hunters. Phoenix has never been the same since this event occured. She has never had a mate or kits and has never been a part of another pack since she was born. Home: Phoenix lives in a stone cave she found when she ran away from the hunters that killed her family. The location of the stone cave is deep in the woods, a few miles from the Northern and Southern Packs. She made sure that there were no wolves in the area at the time before she moved into her new home. Ooohh.. So you're a Loner? Shall I add you to the 'Loner' group? Thanks! Great to be here! Love your character too, Lightningscar!!!! Can Phoenix and the Magister be best friends and live together or something? Pretty good ooh she's attractive! I dont think anyone has looked at mine yet. Awwh, I like the picture! SHINY FUR. Don't you mean can't look away?